The Navajo-Churro Sheep Presidium was founded in 2006 to revive this ancestral Navajo breed of sheep, and to support the livelihoods of Diné sheepherders. This original, hearty and adaptable breed yields multi-colored fleece excellent for spinning, weaving and fiber arts. The meat is lean, sweet and nutritious.The goal of the Presidium is to foster a viable income for traditional Diné sheepherders and weavers by establishing a niche meat market for Churro lamb and mutton, in addition to wool and fiber arts. “Had an amazing time at Jijak, this is what Indigenous food sovereignty looks like, so inspired by all of the amazing chefs, farmers, butchers, seed keepers, hunters, healers and community. Thank you for sharing your knoweledge and inspiration. Indigenous Food sovereignty is the right of people to have access to foods that are healthy, culturally appropriate and that tells a story of our peoples. Food sovereignty is a way for communities to empower themselves and have access to the food that has been part of our history in a way that is spiritual, ecologically sound and connects us to the land and future generations. I challenge you to look beyond the picture of an animal being killed and think of what it really represents, not only food access to our foods, a spiritual connection and preservation of culture. Having the opportunity to cook (Native American Culinary Association 2015) with Churro lamb, and now being able to butcher with Aretta, it has become clear that this food is not only nourishing for the body, but it goes beyond that – it connects us to the history of our peoples. There’s a lot of similarities between my indigenous peoples throughout the Americas: a history of genocide, displacement, ecological warfare that destroyed our traditional ways of agriculture in favor of foreign European crops like wheat, and stories that have been told for generations and a traditional ways of living responsibly in harmony with mother earth has not been lost. It is imperative that we acknowledge and remember that animals have been great companions on our journey post colonization, sheep for the Navajo, sheep and goats for the nations of Oaxaca, and even if this animals came with the Spanish, they adapted with us to our new reality, and have been part of our diets, stories and culture. 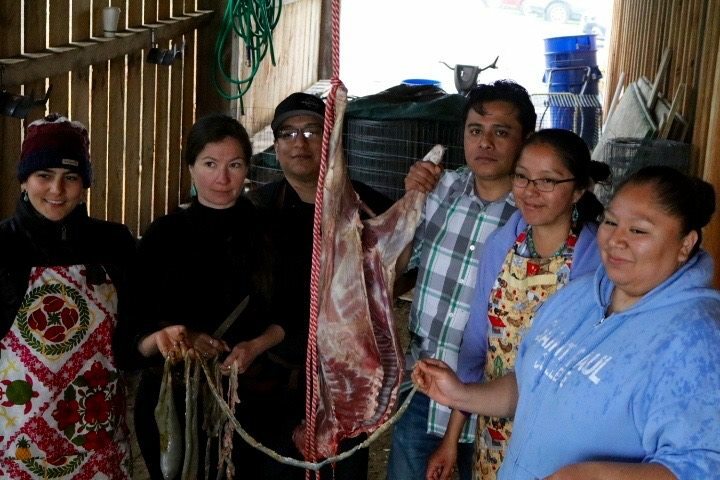 Having a slaughter at a conference like Jijak goes beyond being a “workshop”, it is a way of honoring our past, indigenizing the food movement, and most important – sharing and revitalizing traditional foodways. It is NOT about following the trends in gastronomy, because Indigenous peoples have always approached slaughtering “nose to tail” and our agriculture has always used “permaculture” methods and cooking has always been “farm to table”, there has never been any other way, not only out of necessity but most importantly out of respect for animals, the land, and the rhythms of life in nature. Posted by Chef Neftali Duran & with quotes from Director of DBI Aretta Begay. Celebrate the Navajo sheep culture and pastoral lifeways this summer. Co sponsored by the Land Grant Office of Dine College. Shiprock, NM: Today, the Dine Be’ Iiná Inc have launched an all volunteer effort to conduct the Sheep Is Life annual event to focus on continuing the interest in the Navajo sheep culture and spirituality. Sheep Is Life will be held June 12-19, 2016 in Tsaile, AZ at the Dine College Campus. Sheep is Life is a gathering for all weavers, artists and those who love sheep, wool, fiber arts and the diverse cultures that have maintained these lifeways for thousands of years. Sheep is Life also focuses on the role of raising awareness on the role of the Navajo-Churro sheep in the evolution of Navajo weaving; special qualities of Navajo-Churro wool, meat and survival rates; and economic development for small scale sheep and wool producers. Everyone is welcome. Bring tools, spindles, sheep, wool, art and creativity to share. 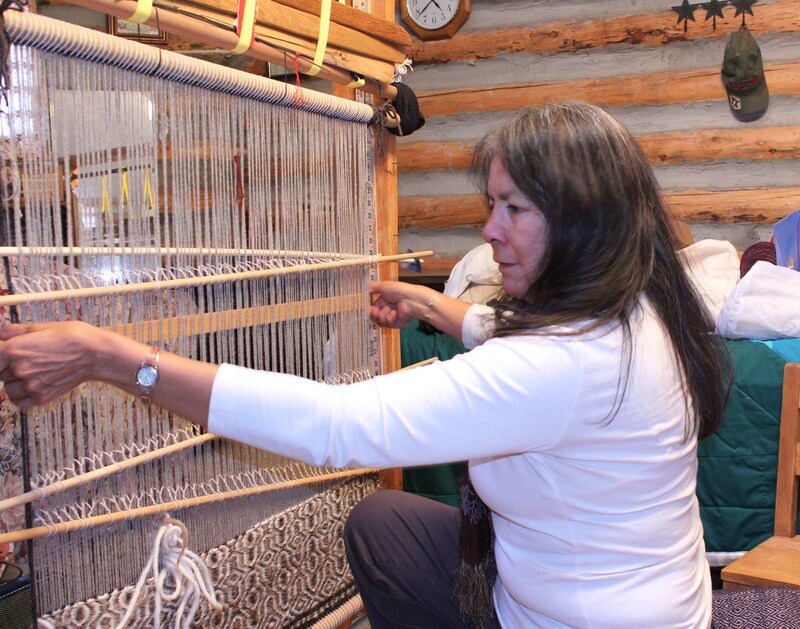 Pre-Celebration Fiber Arts Workshops will be held from June 12-17, 2016 include weaving workshops, , twill weaving, hand spinning, carding, wool dyeing, vest felting, sash belt, horse cinch weaving, lead rope braiding and advance weaving techniques. Free public events will be held on June 17-19th which includes sheep and wool shows, speakers, workshops, vendor, tasting event, youth activities, seminars, sheep to loom demonstrations, Navajo fiber show/store and many more. Dine Be’ Iiná Inc is a nonprofit organization incorporated in the Navajo Nation since 1991. Dine Be’ Iiná’s mission is to restore the balance between Dine Culture, life and land. It is managed by a volunteer Board of Directors and assisted by many individuals who generously contribute time and resources. We collaborate with many other organizations that we collaborate with in providing workshops and promoting leadership, economic development and support for traditional lifeways of Diné shepherds and fiber artists. Horse cinches woven by children at the 2005 Kady Youth Sheep Camp. To create a high quality fleece, the animal must have consistently good nutrition and be free from stress and disease. Clean environments also contribute to good quality of fleece. Good breeding practices must be followed to ensure that the proper genetics for high quality Navajo-Churro Wool are passed on to offspring. Sheep health care, wool grading and judging, and sheep shows at Sheep Is Life help producers learn what it take to produce quality fleeces. First, wool must be shorn from sheep. Blade shearing done by hand can be very time consuming. A good blade shearer can beat the machine, but few have this skill today. Machine shearing requires a power source. If the machine isn’t portable, herders must transport their sheep, a difficult, stressful undertaking. 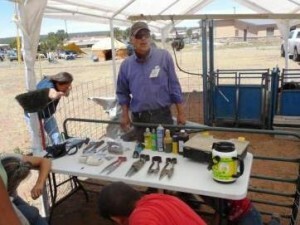 Blade shearing is the most traditional and practical solution when dealing with the average-sized Navajo flock (25-50 sheep). Proficiency in both mechanical and blade shearing should be improved. Next, shorn fleece must be skirted: the manure, suit, sticks, and other trash sticking to the edges of the fleece have to be cut off and the fleece picked over to remove vegetal matter. The fleeces are then sorted by grade and color, marked by producer, and packaged for handling and storage. Cleaning or Opening. While a good Churro fleece can actually be spun right off the skirting table, most fleeces have to be cleaned and washed. Prior to washing, the fleece must be opened to release dust and open locks of wool for penetration of the scouring agents. This can be done by hand, with several kinds of tools, or mechanically. Churro wool can be cleaned with white clay, but the washing method applicable to most wool produced on the Navajo Nation requires hot water and scouring agents to remove the lanolin and dirt. The clean, opened fleece needs to be moved through a series of four hot water baths, of which two contain detergent. The wool must be handled gently and not allowed to cool between baths. This is to prevent felting. It must be “squeegeed” (the water pressed out rather than wrung out) between bath one and two so that most of the dirt and lanolin are left behind. Scouring agents maybe used to remove grease, which inhibits mechanical processing of the wool. Navajo-Churro wool tends to have less grease than commercial breeds making washing much less intensive. A few hand spinners may prefer to leave grease in. If there is a sufficient amount, the lanolin removed from scouring may be recovered as a by-product. Finally, the fleece must be dried carefully so as to prevent felting. Most spinners prefer working with roving. This is created by card (similar to combing) the wool so the fibers all go the same direction. Carding can be done with hand carders (small boards with teeth attached like a metal hair brush), hand-cranked drum carders (drums covered with the same type of toothed material), or motorized drum carders. Motorized drum carders come in a range of sizes from small carders for home use to larger ones for cottage industry. The larger carders can also produce bats, which are useful for quilting and for felting. Bats are sheet like where as roving is rope-like. The length, width and thickness of roving or batting depends on the methods used to create it. Wool can be dyed at any stage after washing, depending on the needs of the final product, the desires of the spinner/weaver, and the processes to be used. Dyeing requires hot water, and sometimes the wool must sit in the hot water for a day or longer. The wool must then be rinsed. The wastewater requires careful disposal according to manufacturer’s recommendations and the condition of the local wastewater system. Dyeing process using natural materials are not benign because they usually depend on mordents. Spinning. The last stage of processing is spinning the wool into yarn. Spinning can be done with the thigh spindle (traditional Navajo), drop spindle or a spinning wheel. Diné philosophy, spirituality, and sheep are intertwined like wool in the strongest weaving. Sheep symbolize the Good Life, living in harmony and balance on the land. Before they acquired domesticated sheep on this continent, Diné held the Idea of Sheep in their collective memory for thousands of years. While wild mountain sheep provided meat and the Diné gathered wool from the shedding places, the species of sheep in North America do not have a herd behavior that permits domestication. As a result, the Diné asked their Holy People to send them a sheep that would live with them and with care they would provide a sustainable living. In the early 1600s, Navajo acquisition of “la raza churra” sheep from the Spanish colonists inspired a radical lifestyle change to an agro-pastoralist way of life and expanded mobility. In the high deserts and wooded mountains of Diné Bikéyah (Navajo Land) Diné pastoralists developed the Navajo-Churro breed, which thrived under the spiritual and pastoral care of their new companions and assumed a central role in the People’s psychology, creativity, and religious life. With songs, prayers, and techniques taught to them by Spider Woman and looms first built by Spider Man, traditional Navajo weaving evolved to utilize the special qualities of the glossy Navajo-Churro wool. As the Navajo managed their flocks for over 350 years, they evolved the Navajo-Churro, a breed recognized by the American Sheep Industry. They are hardy and have excellent mothering instincts and successfully lamb out on the range with little assistance. Smaller than many commercial breeds, they eat less and do well on forage alone. They do not need grain. There legs, faces and bellies are free of wool so they do not pick up burrs. They are tall, narrow in build with fine bones, making them sound, agile and fast out on the range. Carpet-wool sheep have two lengths of fiber, an inner coat of fine wool with an outer coat of hair. Navajo-Churro fleece is low in lanolin requiring little water for washing. It may be spun directly from the raw fleece without time-consuming carding. The wool comes in natural colors and is very high in luster which are highly-prized by hand-spinners. Yarn spun from this type of wool is extremely strong and durable, making it excellent for the Navajo rugs, horse cinches, and belts. In addition the wool can be easily felted for a variety of uses including hats and outer garments; the distinctive long-haired pelts are highly valued. Navajo-Churro Sheep are also excellent for milking. A range of dairy products is possible. Because Navajo-Churro store fat in their bellies, the meat is very lean in comparison to the meat of other contemporary breeds. The lightly flavored meat is prized by Chefs and brings a premium price. A series of Federal government actions led to the almost total eradication of the Navajo-Churro breed, disrupting the chain connecting Navajo culture, weaving, traditional lifestyle, and self-sufficiency. In the early to mid-1900s, market forces, ignorance, and misguided attempts to “improve” Navajo wool, depressed the economic value of Navajo-Churro sheep and led to their almost complete extinction. During the 1930s, Navajos were forced by the United States to radically reduce their herds – the wellspring of their Good Life. Government agents went from Hogan to Hogan, shooting a specified percentage of the sheep in front of their horrified owners, who love their sheep and regard them as family members. First to be shot were the Churro, because the agents thought this hardy breed was “scruffy and unfit.” Today, elders tearfully recall that time and can describe in detail each sheep that was killed and the exact location of the massacre. At the same time, traditional summer grazing lands in the mountains were appropriated by the U.S. government and a system of allotments was instituted which disrupted the traditional way of family land management. In the late 1930s and ‘40s, Federal agents discouraged raising the Navajo-Churro encouraged cross-breeding with other fine wool genotypes. This practice has led to wool that is very undesirable for both the commodity market and the specialty wool market. 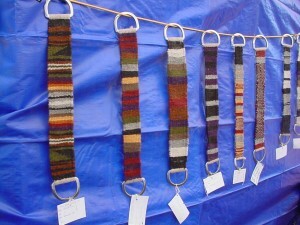 The shorter wool fibers of commercial breeds break easily when hand spun using traditional Navajo methods and do not take the native, natural dyes very well. Navajo weavers became discouraged with trying to process this new wool by traditional means, and many began buying commercially produced and dyed yarns. While beautiful weavings have been created with commercial yarns, their use has contributed to breaking the traditional tie between sheep, wool, land, and weaving. Weavings made with commercial yarns are not as durable, and the texture and quality are not the same as those created with Navajo-Churro wool. Among today’s informed collectors, weavings from Churro wool command premium prices. By the 1970s, only about 450 of the old type Navajo-Churro existed on the entire Navajo Nation, and only a few specimens were preserved in other locations. The conventional wisdom of the time was “the breed is not useful – let it die out,” an attitude often directed towards the traditional cultures, themselves. The disappearance of the Churro has adversely affected the Navajos’ health, as well as economic opportunities for specialized niche markets for meat and wool. In the mid-1970s, animal scientist Dr. Lyle McNeal, sheep industry expert with Utah State University, recognized the genetic and cultural significance of the Navajo-Churro. He searched out enough remaining Navajo-Churro sheep to start a foundation flock. From this flock he has been able to re-introduce Navajo-Churro Sheep to the Navajo people. In 1977, Dr. and Mrs. McNeal founded the Navajo Sheep Project. The project has placed many breeding stock with Navajo families and helped form the nucleus of Ganados del Valle/Tierra Wools flocks in Los Ojos. The Navajo-Churro Sheep Association was founded 25 years ago to maintain a breed registry and ensure quality. Today, there are several thousand sheep of this breed from throughout the United States registered with the association. Yet the numbers are too low for the breed to be safe and Navajo Churro Sheep continue to be listed by the Livestock Breeds Conservancy as “threatened by extinction”. The Navajo-Churro Heritage Lamb Presidium was formed in 2007 with help of Slow Food International. The Protocol Guidelines of the Navajo-Churro Lamb Presidium (NCLP) include breed registration requirements, care, feeding, slaughter, labeling, and marketing, and a Member Agreement is to be signed by all members signifying a considerable level of cooperation. The group has created its own brand and label. They utilize brokers to develop relationships with Chefs and others who purchase their lamb for a premium price.